What’s the matter with men? has so long been on the tip of our tongues I forget when we started asking it. It precedes Kavanaugh, Weinstein, President Trump: The notion that American men are in “crisis” dates, depending on the source, to the Spanish-American War, the Eisenhower era, or the 1980s, and even in eighth grade health class in the dullest of Boston suburbs, it seemed important to screen Tough Guise. The ostensible causes of the crisis are capacious enough to risk losing their meaning—from the transformation of the labor market to the internal contradictions of patriarchal culture—but the problem, from the perspective of popular media, is not simply the surfeit of “difficult men.” It’s the resulting absence of decent ones: On television there are, and have been, too few Jack Pearsons, Daniel Holdens, Gordon Clarks; Dale Coopers, Luis Salazars, Pray Tells; Jeff Trails, Ali Soufans, Adrian Bosemans. Men of character, of principle, of honor and valor, though not necessarily in the traditional sense. When I was growing up, we called such men role models, though it’s been so long since this went out of fashion I forget what it’s like to have one. Fred Rogers was such a man: as gentle as Daniel Striped Tiger and as protective of his charges as King Friday himself. He implored us—more than four decades’ worth of American children—to know that “feelings are mentionable, and manageable.” He explained the meaning of “assassination.” He made sense of death, divorce, the Challenger disaster, and the terrorist attacks of Sept. 11, 2001, to say nothing of the hundreds of everyday hurdles he helped us leap. As role models go, though, Mister Rogers might have been too dauntingly perfect: Is it possible to imagine oneself wearing those cardigans, those sensible lace-up shoes? To emulate a figure so stable, so centered, he famously weighed in at 143 pounds each morning of his adulthood? To find instructions for being a better man in the teachings of a saint? That Neville declines to pursue the subject further might explain the attraction of Showtime’s equally fascinating, frustrating Kidding. 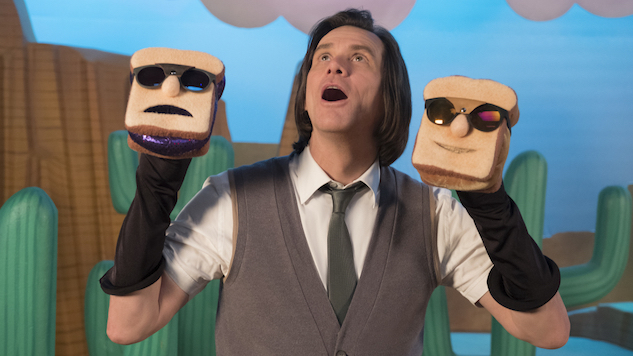 The series, from creator Dave Holstein, stars Jim Carrey as the Rogers-esque “Jeff Pickles,” the host of the beloved, long-running Mr. Pickles’ Puppet Time and, as the narrative begins, a bereaved parent marking one year since his adolescent son’s death. The promise of Kidding is to fill in the sorts of spaces Neville leaves blank, to peel the onion of an icon until we understand that he’s not only a “minted image,” a “trusted brand,” but also a son, a husband, a father, a man. “I have a tremendous amount of pent-up anger, and I don’t know where it’s coming from or how to stop it,” Jeff explains to his young love interest, Vivian (Ginger Gonzaga), on their first date. “And every day, it grows and grows. And I know I dress like a Mormon, and I talk like a monk, but inside I’m Mount St. Helens and it’s 1980 and I am magma from the neck down.” It goes beyond rage, though. From his thwarted ex-wife (Judy Greer) and rebellious surviving son (Cole Allen) to his protective sister (Catherine Keener) and meddlesome father (Frank Langella), Kidding is at pains to point out that Jeff’s genuine compassion for strangers alienates those closest to him, prying open the tiny crack of John Rogers’ comment on “the second Christ.” In the flashback that comprises much of Sunday’s episode, for instance, Jeff pays closer attention to a letter from a death row inmate than to his boys’ living room magic act, and hires the man’s son to work on Puppet Time while ignoring the bullying of his own: His need to be needed is so white hot it blinds him to the needs right in front of his eyes. This is, or should be, bracing material, the deconstruction of a decent man. But if Won’t You Be My Neighbor? appears unable, or unwilling, to dig into Rogers’ private life, Kidding suffers from the opposite problem: Against the dramatic possibilities of Jeff’s personal growth, Kidding’s treatment of Puppet Time seems dismissive, or at least quaint—more a whimsical workshop for director Michel Gondry than for Jeff’s own characterization. For much of the season, it’s possible to place the blame on Jeff’s imperious father/producer, Seb; whether he’s nixing an episode about mourning or developing an absurd Pickles on Ice concept with Tara Lipinski, his vise-like grip on the Pickles persona is designed to keep the program from offending, or even challenging, anyone. Disappointing, then, that Jeff’s creative flowering should sound the same note as the 42-year-old Network, rather than reflect a key detail of the man he is, or presents himself to be: He begins recording segments about dehumanization, depression, and food deserts, replete with “veiled Marxism and songs about genocide.” The design of Kidding is often enchanting, from the playful, ever-changing stop-motion titles to the winking, tactile delight of the puppets, including a mop-headed monster named Soap Scum and a talking baguette named Ennui Le Triste. But that design is rather aloof from Jeff himself. After all, the series’ most fantastical sequences—a bravura one-shot sequence of a woman inspired to change her life after seeing Mr. Pickles on television; a private puppet show encouraging Vivian, sick with lymphoma, to undergo another course of treatment—return Jeff to the role of role model, receptacle of other people’s hopes and other people’s dreams. While neither Won’t You Be My Neighbor?—inspiring, if slim—nor Kidding—ambitious, but uneven—quite manages to find a man in full in its central figure, their attempts to do so are tantalizing: In a culture so long inured to the idea that men’s success, personal and professional, depends on being “difficult,” the decent man is, or could be, a potent figure, the dramatic corollary to the renaissance of the earnest sitcom. If both Neville’s film and Holstein’s series bear traces of the pop cultural past, then—namely, the erroneous belief that aspects of Fred Rogers’ or Jeff Pickles’ lives must be excised or exaggerated to hold our attention, and perhaps our trust—they also pose essential questions for the pop cultural future. Can we imagine more men of Mr. Rogers’ ilk—men in other professions, of other faiths, from other places in other times? Can we devise more heroes whose superpower is not muscle, but mettle; not action, but reflection; not force, but grace? Kidding airs Sundays at 10 p.m. on Showtime. Won’t You Be My Neighbor? is available for rent or purchase on Amazon Prime Video, YouTube, Google Play, and more.